The word limbu means an archer, or bearer of bow and arrows. Their ancestral and original stronghold popularly known as Limbuwan spans in Nepal from Arun River to the east and Sikkim and West Bengal states of India to the west. In Nepal, Limbus live and work in the districts of Sankhuwasabha, Tehrathum, Dhankuta, Taplejung, Panchthar, Ilam, Jhapa, Morang and Sunsari. Their scripture is called Mundhum. Phedangma, Shamba and Yeba-Yema are their sacred specialists. They celebrate the dance festivals of Kelang popularly known Chyabrung (two-sided drum) and Yarak (Paddy dance) as major events. Limbus have their own script called Kirat-Sirijonga. There are many books written in the Limbu language. Their faith is enshrined in the evergreen Cynodondactylon (dubo) grass and rocks. They cremate their dead. The population of the Limbus, according to the census of 2001, is 359,255. Language and Script : Limbu language is a member of Tibeto-Burman language family. Limbu language has four main dialects: Panthere, Phedape, Tamarkhole and Chhathare. Limbu language has 9 vowels sound, and 25 consonants. Promonolisation, three numbers (singular, dual, and plural) with inclusive and exclusive in dual and plural numbers in first person, and glottal stop are some of the characteristics of Limbu language. Limbu language has its own script known as "Kirt-Sirijonga Script". According to many historians, King Sirijonga invented "Kirat-Sirijonga Script" in the late 9th Century. It disappeared for many years and reintroduced by Te-ongsi Sirijonga (believed to be reincarnation of King Sirijonga), in 17th Century. In 1925, Iman Singh Chemjong (Limbu scholar) named the script, after the name of Sirijonga who had laid down his life for the preservation and promotion of Script in 1743 A.D.
Culture and Tradition: Limbus have distinct culture and tradition. The life philosophy of Limbus is based on Mundhum. Mundhum is a oral scripture, it contains cosmology, cosmogony, mithology, stories and history of Limbu people. The life rituals of Limbu are based on Mundhum. Limbus customs, ideologies, moral values, thoughts are guided by Mundhum. Even though it is not in the written form, it is often cited by Limbus during their life-cycle. Mundhum is a vital document for Limbu laymen, and Phedangma, Samba, Yeba, Yema and Bijuwas (Limbu Shamans). These Limbu shamans have been reciting this scripture "Mundhum" from the time of immomemoral during the performance of rite and rituals. They are the custodians of Mundhum. These shamans are not only performers but also healers. They bear knowledge of this world and the other world, medicinal technology, diseases, plants, animals, etc. They possess important place in Limbu society. Sappok Chomen (womb rite): Sappok Chomen is an imporant rite, this is done for the safe birth, good health of mother and child. This is done during six to nine month pregnancy. This ritual is very important in child and mother's life. If a faimily cannot perform this ritual during the pregnancy then they have to do it after the birth. This ritual is performed for three days, first two days outside the house and the third day inside the house. (f) performance of Mangenna for the good health of pregnent woman. In this way ritual touches every aspect of life, which could be harmful to pregnent women and her baby so that she could have healthy child and safe delivery. Yangdang Phongma (birth rite): This rite/ritual is related to the naming of the baby and purifying the house. The literal meaning of Yangdang Phongma is hung a curdle. This rite/ritual is done in three days for girl and four days for boy, after the birth. When a baby is born, the house is considered as impure and hence this ritual purifies the house. During the ritual, baby is shown to sun and baby-song is sung. ChangmaLekma (change clothing): When children reach the age of adolescent, they were given new clothes. Boys were given Daura-Suruwal (manly clothes), khukuri (knife), bow and arrow, and they were taught some moral values that man should learn such as hunting skills, not to offer flower to his sister, should not mix his clothes and utensils with his sisters, learn to make arms, etc. This is the indication that boy has turned into manhood and he should learn masculine values. Similarly, girls are given Gunyu (womenly clothes ), ornaments, accessories, shawal, sickel, etc. She is equipped with life-skill such as knitting, weaving, and other moral values. In this way, she is taught to be feminine. Metkkhim(marriage): Metkkhim is done in two way, one is arranged marriage and the other is marriage by elopement. Marriage is a long process; first of all parents of groom should offer two bottle of home made wine in two steps: deranakma and pantapma, to bride's parents to confirm the marriage. If they accept the bottles of wines and they fix the marriage date. Marriage is celebrated in various stages; first a group of people from groom side goes to bride's house. In the bride's house, preparation is made for the farewell and bride is sent to groom's house with her Metkesama or Menchhyaburukma (bride's friends). All the rituals of marriage is performed in groom's house. There are two types of metkkhim, one is arranged and other is elopement. Netma/Khauma (death rite): Death rite is also a long process. When a person dies, s/he is given shower, put on new clothes, and he is put into a coffin (made of wood or bamboo) with flowers. Coins are kept on the forehead, chest, and abdomen of the dead. Bronz plate filled with one mana (traditional measuring unit) of rice and a coin is kept under the head of the dead. These things are kept as the travelling package for the dead to reach the other world. The procession of the dead is officiated by Phedangmas, relatives of the dead, and villagers. Gun is fired and Nagra (kind of drum) is beaten during the procession. When they reach the grave place, they had to buy land from Khambongba-Lungbongba (who are considered as the son of land) to bury the dead. Death rite is completed in mainly four stages. (1) Samsama is done in the night after the dead is buried or burnt. This is a process of officiating dead to the other world. (2) Yumchama/Yumsama (Makche) is mourning process in which family member do not take salt, oil, meat, ginger, and garlic for three and four days for female and male respectively. If the child is new born baby whose birth rite is not done then family should not prohibit eating above things. (3) Khauma Phaje is done within a year of the death on the odd day or month. This is a process of purifying the family of dead and after this ritual family members could participate in fest, festivals, and other celebrations. (4) Mikwa Sangma is the last ritual, in which complete segreation between dead and living is done. This ritual is related with Tongsing ritual. This is done for the peace, progress and prosperiority of the family. Tongsing : Tongsing is an imporatnt ritual of Limbus. This ritual links the living ones with dead ancestors. The Literal meaning is "an act of cooperation, coming together, coming in agreement or conciliation, becoming correct or fitting". Tongsing Takma is a ritual of social solidarity or cooperation initiated and performed by a particualar family or families for their welfare, prosperity and happiness. Tongsing is usually done for three days, sometime it is done for five days also. Tongsing is performed every year. Nahangma : The literal meaning of Nahangma is 'raise one's head' because this ritual throw away envy and jeoulsy so that a person could live with dignity and pride. Nahangma is a raising head of the household or the chief of the family for the successful attempts for the good fortune of his family. This ritual is done in every three years in the Udhauli i.e. beginning of winter season. Yebas (Yaba - priest of Limbus) are dancing during performing Tongsing Takma Ritual. Chasok Tangnam : Chasok tangnam falls on the full moon day of Mangsir (eighth month of the Nepali calender or end of November in English). But Kirati celebrates this festival for three days. Different Kirat comunities call it by different names such as Limbu called it "Chasok Tangnam", Rai call it "Sakela", Yakkha call it "Chasuwa" and Sunuwar called it "Pholsadar". This festival is related with new harvest, food, and technology. Relatives get together in this day and share congratulations having delicious foods. Various rituals are also performed in this festival to protect family/clan from diseases, envy, evil spirits, etc. and also for the peace, progress and prosperiority. There is a folk-tale related to Chasok, which is like this, long long ago Limbu used to eat uncooked yams, roots, etc. They had no cereals and vegetables. They had no fire to cook yams, potatoes, sweet potatoes, roots, etc. Observing the poor situation of the Limbus, Tagera Ningwaphu Mang gave them seeds of takmaru (rice), parama (millet), kyabo (barley), etc. The time period was of Yethang, the ancester of Limbus. Sibera Yekthumma Sibera Yabhunggrekma, sister of Yethang, planted the seeds with help of wooden and stone tools. The takmaru, parama, kyabo, etc. grew up and she tought her brothers and relatives to light the fire and to cook foods. Then they got rid of many diseases i.e. vomiting blood, diarrhoea, marasmus, goitre, deafness, blindness, etc. So, during the festival Limbu people whorship Yumasam, Thebasam, Thungthangba, Chokhoba, Miseksam and Saya Muden. They present new foods i.e. rice, millet, barley, corn, etc. to goddesses and gods. They ask goddesses and gods for power, good health, wealth and prosperity. Limbu worship gods and goddesses in groups/seperate by every family. The new harvested cereals or foods are offered to goddess and gods, and if they do not offer it to gods and goddess then they believe that they will suffer from many diseases. Kakphewa Tangnam : Kakphewa tangnam is celebrated as new year day. It falls on mid-January. In this day people take shower early in the morning and have yams and sweet made of yagrasing oil. In the beach of Mai river and other places meela (fate) took place for several days. In mela, people buy various products such as utencils for kitchen and firm, clothes, cereals, ornaments, etc. People usually attain the fate to enjoy and meet people coming from various places. Yakwa Tangnam : Yakwa tangnam is related with the worshipping of land. This festival is celebarated in Ubhauli (raising season) when khembreka (peach) starts to bloom. During the festival Yakwa ritual is performed, this ritual is officiated by Phedangma. Phedangma recite Mundhum, related to development of agriculture and prey for the better harvest, because on this season people plant virous crops and vegetable. Sisekwa Tangnam : Sisekwa Tangnam is an another festival of Limbu community. It lies on the first day of the Sisekpa la, 7th month of the Yele Tangbe (Kirat calender) or on mid-July. Limbus believe that Sakchyong (the king of starvation) enters in their houses and his presence make them suffer from lack of food or starvation. To be free from the bad impression of Sakchyong, Limbu chased him away, in this festival. Before chasing Sakchyong, people collect various kinds cereals and vegetables such as corn cob, cucumber, chilli, tomato, etc., flowers and leaves of paramsing. They also bring ing or pyabo (frass kinds) and web a rope from them incerting garlic other materials which were collected earlier. They hung it on the door. In the evening, they share nice, meat, beer, etc. for Sakchyong. In the night, ang tyalo or pine-wood fire-lights are illuminated and others others carry nanglos (tool to separate rice with husk) and other instruments to beat. Then family members start to search Sakchyong in every corner of the house with light and beating nanglos. The elder of the house chant the Mundhum of Sakchyong and others shout, 'lande peyeo Sakchyonge' i.e. go out Sakchyong. They run chasing Sakchyongw away, far from the house throwing fire-woods and fire-lights. In that time, they call earth, sky and all other mang and sammang or gods and goddesses for their long life prosperity and so on. In this way, they celebrate Sisekwa tangnam and drives Sakchyong or starvation away. Walihang Tangnam : Once upon a time, there was a kind Kirat king named Walihang. He was very religious, kind for people and wise, too. People loved and respected him, very highly. Because of his insight, he knew that he was going to die in Thesekro (Kartik in Nepali calender) on no-moon day. Then the king called his ministers and citizens in king's palace and informed it to them. All the ministers and citizens felt very grief hearing about his death. They ask the king, if there was any way to escape from the death. Listening to them, he responsed his countrymen that if they worshipped the god for the whole night begging for his life by lighting the lamps, he might live. Then, all the people of the kingdom, lit lamps around their houses and worshipped the god throughout whole night of Thesekro. Because of people's love to the king and worship, god felt verry happy, and blessed the king for long life. Knowing this, all the kingsmen celebrated the happiness. According to the order of the king, ministers and agents moved from door to inform the news saying 'Bualihang le Kuban Isik'. Since that time, Limbu people started to play Laringgek and Namlinggek, singing song of the Walihang. This song is sung in a typicle way, a person leads the singing and other follows him. The occasion of Walihang Tangnam and Dipawali of Hindus, fall at the same time. But they do not worship crow, dog, cow and ox, as Hindus. The Limbu sisters do not offer flower garland to their brothers too. They express their warm happiness and long life to each other. They wear new clothes, have delicious foods and play Laringgek and Namlinggek. Laringgek for night and Namlinggek for day. Music and Dance : Limbu people have own primitive musics and dances. Those musics and dances are practised by Limbus for unknown time. The art of arranging the sounds of voices in Limbu community, is unique and different token of musics which can introduce Limbu people and their community so explicitely. Same way the instruments of musics and dances also are typical ones. The representative word of music, in Limbu language, is 'samlo'. The word "mukla" or "mung sama" means musical instrument and 'lang' is the synonymous term of dance. The tunes of Palam, Hakpare, Khyali, Kesam, Mundhum, Maangha, etc. are the popular Limbu musics, which are practised by Limbu in their day-to-day life. Ke or Chyabrung, a long cylindrical hollow-long drum is the most popular musical instrument in Limbu society "Kom" is another musical instrument which is hardly three or four inches long and is played by placing it between upper and lower lips and teeth. The Kom is made up of mikla, a kind of bamboo, and metal. Chethya (brass plate) and Ponge are also popularly used in Limbu community especially by Yebas, Yemas and Sambas. Tungeba, single-stringed instrument and Tungna or Unfdung, two-stringed instrument, are also played by Limbus. And Nowamuksam, saucer like a pair of brass instruments, are also widely used in Limbu community as musical instrument. 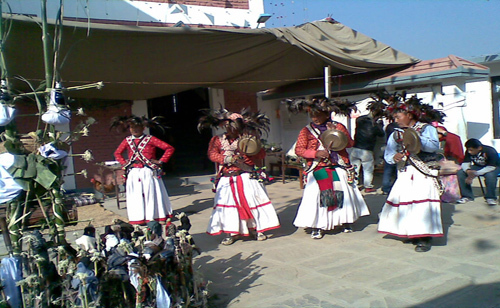 Limbu enjoy various kinds of traditional dances. Yalang, Kelang (drum dance), Samba/ Yeba-Yema-lang (ritual dances) and manglang (devotional dance) are very common dances.